Rudra - an aspect of Lord Shiva is praised as "There is only one Rudra who rules all the worlds". By Svetasvatara Upanishad (3-2). Chanting Rudram is for invoking the Lord and Chamakam is to express gratitude for His blessing. 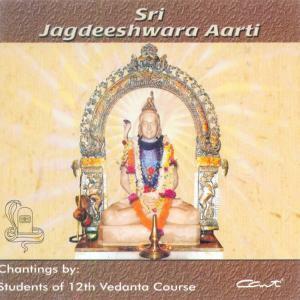 This CD is useful for learning Rudram and Chamakam and contains chanting practice for Rudram, chamakam and Sri Jagdeeshwara Aarti. The chantings are rendered by the students of 12th Vedanta course at Sandeepany Sadhanalaya, Powai, Mumbai. The traditional method of invoking Lord's grace is known as "Aarti" since the inception of the temple at Sandeepany Sadhanalaya . Powai. Aarti is performed every evening at the altar of Lord Jagadeeshwara. Click the button below to add the Sri Jagdeeshwara Aarti to your wish list.